9am-6pm Central time zone. No Sunday calls!! More information has been added to this article 8/19/13. Current prices are on the bottom of this article & on the Outlaws page. The current date for the entire website is on the bottom of the home page. This article is a reprint from 2005. Current prices are on the bottom of this article & on the Outlaws page. Dennis Quackenbush has made more of them than any other big bore he's ever produced, and with good reason. The Bandit combines power and accuracy into a modern big bore that costs around $560. (2003 price) It brings big bore airgunning into the realm of affordability for many serious shooters who want to experience the thrill of the technology without the fuss of vintage designs. The unexpected success has left the maker in a quandary. He didn't want to stop making his most popular model of airgun, but he did want to do something new at the same time. So, Dennis created a special run of .308-caliber Bandits. But, now that it will, indeed, be a production gun, he's changed the name to the Exile. The special part is that these rifles have barrels rifled with a faster twist rate to stabilize conical bullets rather than round balls. And this report tests one of the first rifles he's made. If you read the article about the .50-caliber Bandit, you know that Dennis makes his own barrels; and what he does different is make each one from a solid steel bar! Very few companies make barrels that way any more because of the difficulty of drilling a deep hole that's straight enough to be a rifle barrel. 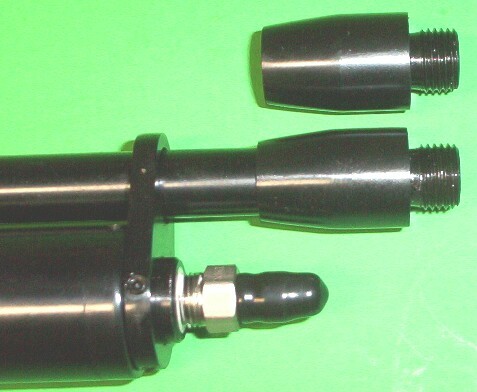 Most big bore airgun makers use seamless hydraulic tubing for their barrels, and it works fine. 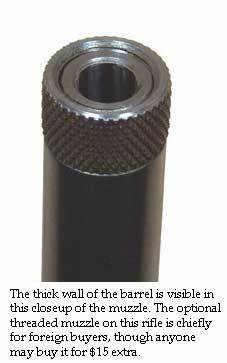 Except that the barrel walls are often on the thin side. Dennis wanted a thicker barrel wall for added stiffness, and the way he got it was by drilling and rifling the barrels in his shop. If that wasn't enough, he then cut-rifles each barrel instead of using a button. He told me that in the beginning he did not know what twist rate would work the best, and since a button costs a lot in terms of either money to buy it or the time spent to make it, cut-rifling is a more affordable way to experiment. While this is most assuredly the old-fashioned way to rifle a barrel, there is no accuracy advantage to it. The flexibility to change twist rates is the chief reason for doing it this way. As long as he isn't hit with orders for hundreds of rifles at one time, Dennis says he doesn't mind the extra work the cut rifling takes. Besides, if a customer discovers another heavier bullet that others might want to try, he retains the option of easily changing the twist rate in the future. 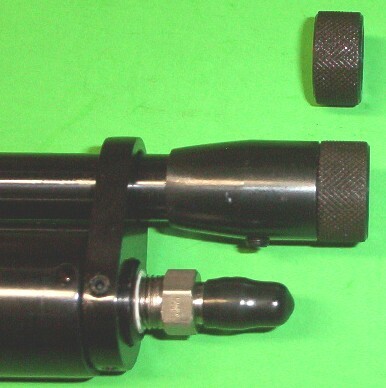 Another Quackenbush trademark is tapered rifling at the breech, which lowers the loading resistance. If the lands are deep where the bullet enters the breech, the force required to engrave a large-caliber lead bullet is so great that you'll hurt your hand on the bolt handle after loading only a few. By tapering the rifling just the right amount, the bullet becomes very easy to load, yet it still seals well when the air charge hits it. 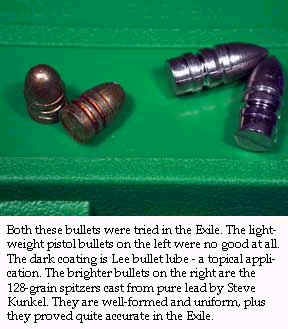 One of Dennis' customers, Steve Kunkel, took all the trial and error out of finding the best bullet for me. Steve casts bullets for his own Exile, so he was able to pick a .308 design that is short enough to stabilize, yet long enough to pack some punch. My thoughts were to start with a 76-grain lightweight slug designed for .30 automatics, but Steve warned me they wouldn't do well in the Exile, and he was right. In a rare turnaround, the Exile shot these lightweight lead bullets faster than the pocket pistols they were intended for, and they could well have been over-stabilized. More on this in a bit. Steve recommended trying pure lead spitzers cast from Lyman mold number 311359. That's a gascheck design; but at the velocities we're shooting, the copper check can be left off. This bullet is supposed to weigh 115 grains when cast from Lyman #2 alloy. Pure lead is heavier than #2 alloy, but not THAT much heavier, so the Lyman figures are off, because the bullets I tested weighed 128.6 grains nominally. They were very well formed, despite the purity of the lead. The bullets were shot unsized, and they measured 0.308 inches to 0.309 inches. I tried both lubed and unlubed bullets and found the unlubed ones were just as fast and perhaps a trifle more accurate. At the subsonic velocities we shoot, there is no chance of leading if the barrel is made well, without a lot of tooling marks inside. And of course there are no combustion gasses to melt the base. Dennis suggests spray-coating the bullets with moly, which, over time, would transfer to the bore and condition it. He doesn't lap his barrels after rifling, so there will be a break-in period over the first several hundred shots as the bore becomes smoother. If you try to lap it yourself, remember that this is an airgun barrel and is free-machining steel and dead-soft. Unless you are very skilled, I don't recommend it. No manufacturer will warranty a barrel someone ruins this way. We'll look at performance first, followed by accuracy and a description of how the rifle feels when shooting. These occurred simultaneously at the range, but I'm separating them here for a better report on each. Every shot went through the chronograph in this test. This provided a look at the break-in of the rifle. The first shot at 3,000 psi went 788 feet per second (f.p.s. ), a number much lower than expected. I watched the chrono and decided that a string of five shots was the best I could get from this rifle. Each successive shot went a little slower, with shot number five of the first string coming in at 732 f.p.s. Readers may remember - from my discussion of how big bores perform - that a spread of 56 f.p.s. is not at all bad for accuracy. The first string of five dropped the reservoir to around 2,000 psi, which means approximately 200 psi was being used for every shot. That's conservative for a big bore, but this big bore isn't really that big. By shooting conical bullets instead of round balls, you get more than twice the bullet weight; yet the smaller diameter saves air. 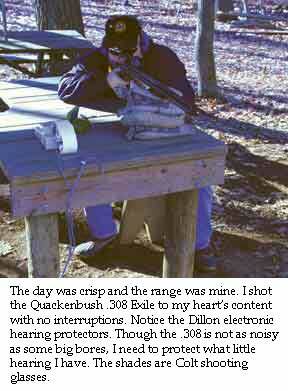 And, saving air was important to me because my aluminum scuba tank was losing pressure fast on the cold range. Fortunately, I had an Axsor hand pump to take up the slack; but with every top-off I had to pump more air to make up for the cold scuba tank. After a 3,000 psi top-off, the second string began at 792 f.p.s., with shot number two going 804. Clearly, the rifle was starting to break in. I had oiled the heavy hammer with Pro Link Chain Lube, a bicycle product for which I am finding more and more uses. It dries, leaving a lubricating film on the parts without attracting dirt. I think a combination of break-in and the right lubrication will extract the last bit of performance from a rifle like the Exile, and I recommend that every owner try it. Earlier experience with .50-caliber Bandits had taught me that they often like more than 3,000 psi, so I increased the fill pressure to 3,200 psi with the third fill (the hand pump makes pressure changes easy). That caused the first shot of string number three to increase to 823 f.p.s. The fifth shot in that string went 757 f.p.s., so the rifle was definitely speeding up. Eventually, though, the velocity settled down to 860 f.p.s. for the first shot of a 3,200 psi fill. Shot five averaged 774. I do believe, however, that there is more break-in than my test allowed for, because Steve Kunkel reports getting a total of nine shots that range from 815 to 870. He shoots his gun a lot, so all the break-in has been completed. He also does some other things that owners can do to their guns, like experiment with hammer spring rates. The bottom line is this - the .308 Exile is a powerful big bore that's also quite conservative with air. You don't need an expensive scope, a 2 1/2 x 32 or a 4 x 32 shotgun scope works very well. The scope is already set for short range parallex and it can certainly take the recoil of an air rifle. With the 2 1/2 power scope, you can shoot with both eyes open, using the scope as an optical sight. I bought one of these scopes from a retailer for under $30. At the 860 f.p.s. velocity I got from the test rifle, the 128.6-grain bullet develops 211.25 foot-pounds of energy at the muzzle. For a .30-caliber airgun, that's pretty remarkable! Because you're shooting a conical bullet, that energy also carries downrange very well. So, this rifle would be suitable for coyotes, raccoons, nutria and javelina out to ranges at which clean shots can be guaranteed. This was one time I couldn't use my 10-minute sight-in that starts at 10 feet. This rifle has to be respected for its power, so indoor shooting and standing close to the target are out. The firing range was completely deserted while I was there, so I took that opportunity to set up a large pistol target at 15 yards. 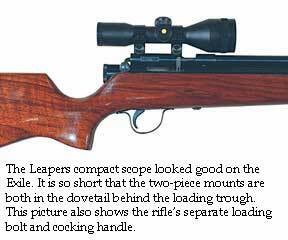 The Exile has no sights, so scoping is required, and I selected a Leapers 6-power compact scope that I often use with big bores. For some reason, it seems to be easier to get on target with this scope than with many other scopes I own. I mounted it in a set of non-adjustable two-piece rings that fit the dovetails quite well. All I expected to do with the first shot was to get on paper at 15 yards. Then I could adjust the scope from there. Shot one was fired and the rifle proved to have very little recoil. The forearm was rested on sandbags because I've learned that Exiles like it that way. All was well with shot number one, except I couldn't see a hole in the paper. Darn! Without delay, I walked downrange to try to determine what might have happened, and that's when I saw that the shot was in the black bull at four o'clock. That kind of luck doesn't happen very often. The spire-nosed bullet tore such a small hole in the paper that it proved impossible to see from the firing line - especially when the Leapers scope only adjusts its focus as close as 25 yards. So I wasn't just on paper, I was almost sighted-in. I shot the next four shots of the string and made the small adjustments needed for a 40-yard zero. Sight-in was over in less than five minutes. The target went up at 40 yards, and the gun was again close to where I wanted it to be. A little high and right, but group two fixed that. 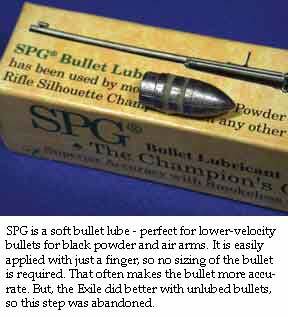 I was still lubing the bullets with SPG bullet lube (finger-lubing just before shooting) through group five, when I decided to see what dry bullets would do. What they did was start tightening the groups immediately. Unfortunately, the velocity was still on the increase, so the scope setting did not remain stable. The groups were now tearing through the bull but they were starting to drop lower on the target as the velocity increased. 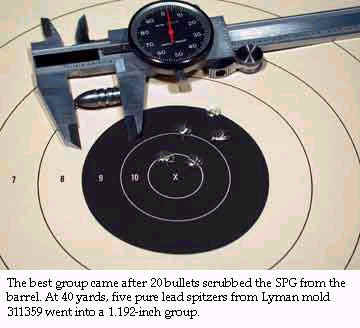 This is to be expected, since the bullets get out of the bore before the recoil lifts the muzzle as high. It's a common phenomenon that carries over from firearms. So, more scope adjusting was needed to get the bullets back in the center of the bull. I think I may have thrown off the test by lubing the first batch of bullets. My best group of the day was five shots in 1.192 inches, center-to-center, and that came after many unlubed bullets had scrubbed the bore clean. Further testing might have produced even better results. Steve Kunkel reports groups of 0.75 inches to 0.85 inches at 50 yards, but he only shoots three shots. A five-shot group is usually larger than a three-shot group, so our results might not be that different than his. Think of the .308 Exile as capable of groups around the inch mark at 50 yards, when the right bullets are used in a gun that's fully broken in. I mentioned trying a lightweight bullet also. The one I tried is a bullet made for .30-caliber automatic pistols like the Tokarev and the broomhandle Mauser, and it weighs just 76 grains when cast in a hard linotype alloy. I had a bunch of these left over from some light load experiments with a .30/06 Enfield and a .30 carbine. I sized some of these tiny pills to .308-inch and lubed them with Lee spray lube, just to see if they offered any advantage in the Exile, but I might as well have shot fishing sinkers! They grouped over four inches at 40 yards. The velocity was much higher, of course. Shot one from a 3,200 psi fill went around 990 f.p.s., while shot five was about 890. Maybe if the velocity were lowered to 700 f.p.s. this bullet would group better, but since I already had the top performer, no more time was wasted finding second best. After all, every five-shot string came at the expense of some heavy manual pumping. I had to top off the rifle with a hand pump after every string, and as the day wore on, the scuba tank contributed less and less to the total fill. It took about 12 pumps to fill the pump, hose and gauge and another 55 to 60 to fill the gun. The day was cold, and by the end my 3,000 psi scuba was only putting out 2,400 psi. Oh, how I wanted a carbon fiber tank right then! Quackenbush's Outlaw series has been successful enough that it is now drawing out some aftermarket attention. A friend of Steve's is Will Hickman from Northern California. Will loves his Bandit .50-caliber, and he created an external power adjuster for it. It's just a means of increasing and decreasing the preload on the hammer spring from outside the gun, but Will finds that it allows owners to adjust for bullets of different weight. This is very important to those who shoot conicals, as all .30 Exile owners do. IS THE EXILE .308 FOR YOU? This is clearly a different gun than its .50-caliber big brother. It shoots long slender bullets instead of round balls, and it produces over 80 percent of the power of the larger rifle. The accuracy of the two is equal out to 50 yards, but the .308 can go a lot farther than that due to the bullets it shoots. The .50 will shoot farther, too, but by 100 yards it will have shed almost half its initial velocity and the .308 will then surpass it in remaining power. The .308 Exile is a gun that does a lot with very little air. Consider that when making your choice. 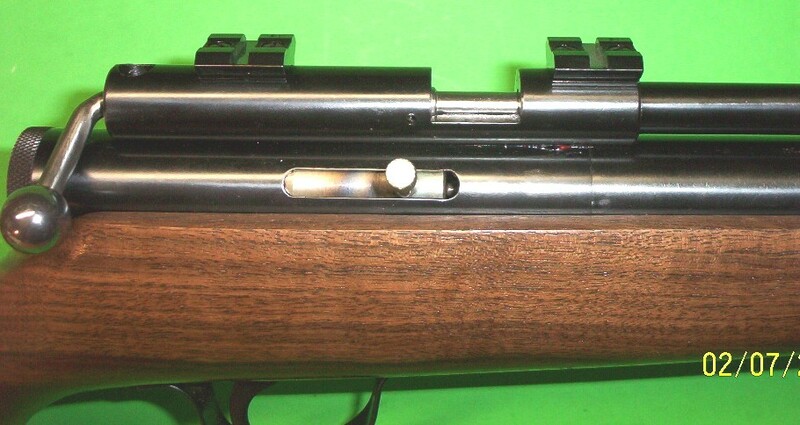 Both rifles require accurate bullet placement for a clean kill, but there should be an advantage to the .30 in the depth of penetration. A real world comparison of the size of these airguns. On the left is a Mauser rifle with a 24" barrel in .22/250 cal. To its right, in the first picture, is a 25" barrel .50 Bandit (the .308 Exile is the same length) and in the second photo is a 20" barrel .308 Exile. 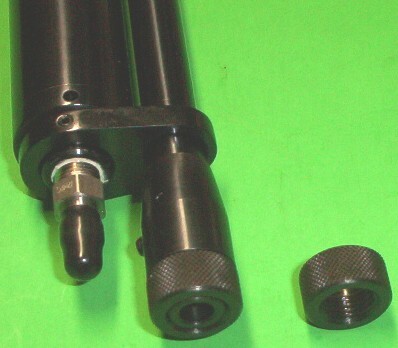 The 20" barrel Exile is a special order item, it normally comes with a 25" barrel. I've included a yard stick to give perspective. I dislike photos with no reference for perspective or such a tight crop that you don't see the whole item. For prices of different grades, go to the Outlaws Page. $30. For the .308 barrel only. The coupling is above & on the rifle below. If you want to leave the coupling on the gun a thread protector to protect the threads. Thread protector is included in the coupling price. Currently made rifles have Weaver scope bases rather than the 3/8"
Seeing the rings is to understand. 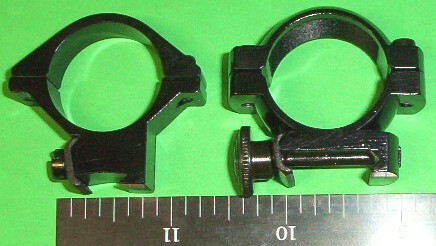 On the left is a 3/8 dovetail mounting ring and on the right is the scope ring for Weaver bases. for filling. There's a picture of it at the end of the owner's manual. Go to the home page, click on the Outlaw Manual and scroll down. The standard rifle I make is right handed. I can make left handed rifles (putting the machine cuts on left side or the right side is the same amount of work, so I don't charge extra for it) but you just need to tell me at the time of ordering so I can machine the parts for left hand. It has a genuine left hand stock too (a mirror image of the right hand stock). See the Stocks page.